Lisa’s enthusiasm for the banjo is evidenced by her quick study of the instrument. 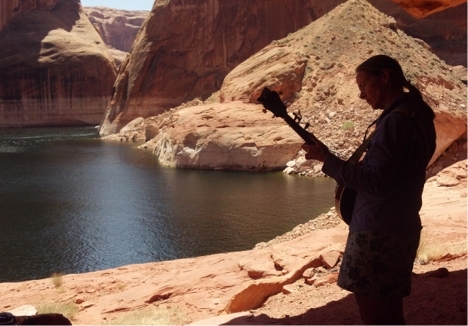 When not practicing at home in Unaweep Canyon, she is either sea kayaking (where she takes her banjo), on long bike rides (where the sag vehicle takes her banjo), or doing anything else when her banjo is at her side. (Did I mention she loves her banjo?). 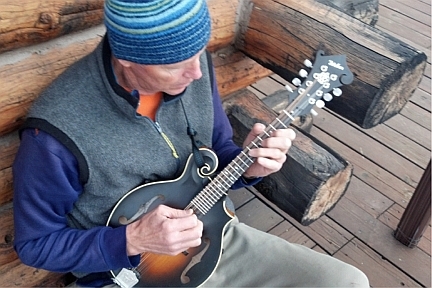 Bob simply loves living and playing in the wilds of Unaweep Canyon, whether on foot, on bike, or with an instrument in hand. Bass player and background vocals. Sometimes plays the guitar but does not like to do anything that he thinks is too complicated. Going from four to six strings means he has to think harder and that interferes with his daydreaming plans. He loves his wife (Jan), their dogs, horses, running, m&m’s and can speak Pig-Latin fluently (of-way ourse-cay). Dean lives about a half mile from Bob and Lisa in the Unaweep Canyon of Western Colorado and the three of them have been adventuring together for many years. He is also proud to be very dyslexic. Too bad Colorado is so far away! Dean – I work with your mother and we’re sitting here listening to your music! You all sound amazing – I love it! Looking forward to listening to more! Thanks Lynn! We are supposed to be recording a CD this fall…I will let you know when it is available! Please include the size of the venu, location, date, etc and don’t forget your phone number!